Whether you need to have gas lines installed for a new home, you need to have your existing gas lines replaced or you have damaged gas lines that need to be repaired, you need help from a professional. Working with gas lines is dangerous, and you should never risk your safety. At Lightfoot Mechanical, we offer professional gas line installation and repair in Fort Worth, TX and the surrounding areas. You probably rely on your gas lines every single day. 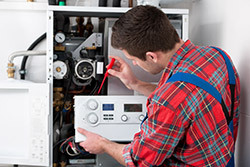 In many homes, gas powers water heaters, stoves, furnaces and even dryers, so it is important to make sure your gas lines are in good condition. You might even use gas to fuel an outdoor kitchen or fire pit. No matter how you use gas in your home, making sure your gas lines are properly installed and maintained is crucial. Gas line installation is a specialized job that needs to be performed by a professional. To get the job done right – and safely – you need to have the right training and equipment. At Lightfoot Mechanical, we will send out a highly trained Fort Worth plumber who is equipped to perform all types of gas line services. If you have any reason to suspect that you may have a gas leak, call us for gas line repair immediately. Gas leaks can be deadly, and having them repaired cannot wait. Shifting soil, tree roots and corrosion can all cause damage to gas lines. Whether it’s a small pinhole leak or a major ruptured line, we offer gas line repair and replacement services to make sure your lines are safe and functional. When you need propane or natural gas line services, let the experts right here at Lightfoot Mechanical help. For the best gas line installation and repair in Fort Worth, TX, contact us today. Call 817-596-0309.